A squirrel is a medium to large sized rodent with a long, bushy tail/ There are several variations in form, behavior, and appearance within this large family of rodents. Currently, taxonomists divide the family into two sub-families: Sciurinae and petauristinae. Within Sciurinae, the Ratufini tribe comprises giant squirrels that live in the tropical forests of southern and eastern India. The Funambulini tribe comprises the striped squirrels. The Callosciurini tribe contains all the non-striped diurnal squirrels, including the northeastern species such as the Pallas’s, the Hoary-bellied, and the Orange-bellied squirrels. The squirrels in the Petauristinae sub-family are nocturnal and include the flying squirrels. In reality, these do not fly but merely glide with the aid of flaps of skin that connect their limbs. The two ground-dwelling marmots are also considered to be members of the Sciuridae family. Squirrels build nests or dreys in tree branches or occupy tree branches or occupy tree holes. Woodland is home for most squirrels as trees provide plenty of food and shelter. The best habitat for squirrels is an old wood with a mixture of trees and good ground cover, with bulbs, fungi and berry-bearing bushes. Good food trees for Grey Squirrels include Oak, Hazel, Ash, Field Maple, Sycamore, Hornbeam and Sweet Chestnut. Grey Squirrels can adapt to the open and are commonly found in parks and gardens. Home for a squirrel is either a nest called a drey hidden in the high branches, or a den in a hollow tree. These provide shelter and a place to rear their young. They are also known to get access to loft spaces when our roofs are in need of repair. Squirrels' diet varies, depending on the season and what is available. They eat catkins, flowers, rose hips, shoots and bark. They may even rob nests in spring, taking both eggs and young birds. However, their most important natural food is tree seed. Squirrels store seeds and nuts by burying them just below the surface of the soil. They make numerous caches with only a couple of nuts or seeds in each one. 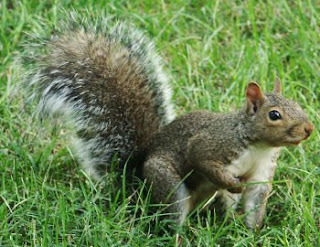 The squirrels' keen sense of smell helps them find these caches when food is scarce.